Commission President Jean Claude Juncker said that if Greece left the single currency area, the “Anglo-Saxon world” would try everything to break it up. 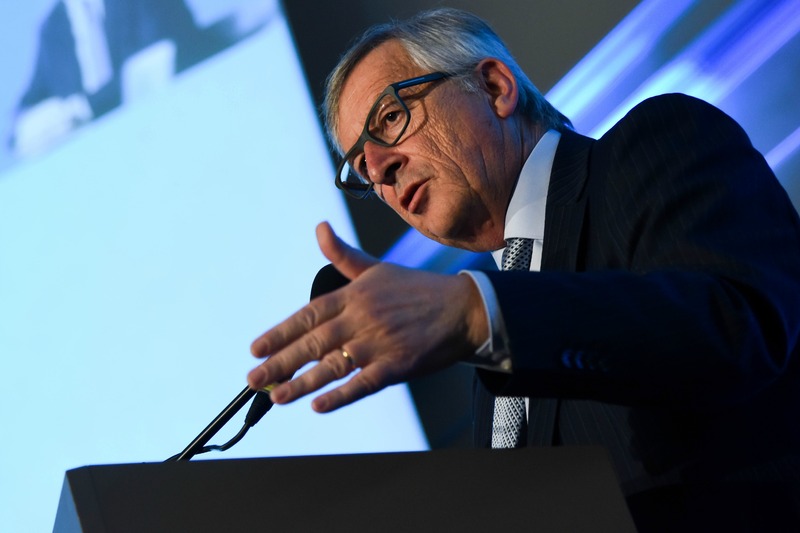 Speaking at the KUL, the Catholic University of Leuven on Monday (4 May) on the occasion of the launch of the Wilfred Martens Fund, Juncker made it clear that a ‘Grexit’ was not an option, because it would be an existential threat to the 19-member economic and monetary union. Juncker added that he had discussed the issue the same day with former Greek Prime Minister Antonis Samaras, who was also present at the event. “Grexit is not an option. If Greece would accept it, if the others would accept it, that the country would exit the zone of security and prosperity constituted by the eurozone, we would be exposed to huge danger, because the Anglo-Saxon world would do everything to try to decompose, at a regular rhythm, by (the) sale, apartment by apartment, of the eurozone,” he said. Later, in the Q&A session, Juncker returned to the issue, speaking this time in English. “We have to know that Greece was misbehaving in the past, that the government of Mr. Samaras was doing the right things, that those who were contesting these right things won the elections. Now they are confronted with their election promises, and we have to deal with that,” he said, referring of the leftist government of Alexis Tsipras. “My concern is not the Greek government. My concern is the Greek people. We don’t have the right to deal with the Greek people as if they were the neglected part of Europe. The Greek people have great dignity. This is a great nation, although being from time to time a weak state, and we have to show solidarity with the Greeks. And the [present] Greek government has to know that at the level of the eurozone, we have to deal with 19 democracies, not only with one, not only with Greek democracy,” he said. One of the questions referred to the UK, and the push of the present government to renegotiate its status in the EU. “I want a fair deal with Britain, but Britain is not in a situation to impose its exclusive agenda to all the other member states of Europe”, Juncker said. Sure we have to deal with one issue at a time. But to survive long-term the EU needs to have core integration. The US would see the EU in a wheelchair and not behind the wheel, and the UK will do the dirty work for them, even if it would wreck their own economy. Who needs enemies with friends like that. They just don’t want the competition, or an alternate opinion on anything. One sign of weakness and you get torn apart. Totally agree with Gerry and for this E.U.’s elected leaders should focus on Acta Non Verba ! With friends like ‘Europeans’ who needs enemies. You just don’t get it Gerry, Europe is a basket-case of its own creation. The USA is not the boogey-man pulling all the strings, Europe is the author of its own mediocrity. This is why UK Needs to get out of euro, the people of Great Britain are fed up with EU sticking their long nose in to our business! As for you Gerry , no doubt their is room in the wheel chair for you?? If may ask why hasn’t EU parliament had internal audit ??? hence we don’t trust anything the EU says. Middle finger comes to mind. “The ANGLO SAXON WORLD” would try to break it up? What world is Juncker living in? He has just confirmed all the doubts I had about him, and the reason why he is the wrong man in the wrong job. The man is a deluded ultra-federalist who refuses to accept reality, even as Greece stands before us as living proof of the failure of EU policy and full fiscal and political integration. How many times does he need to be told, Britain (or the current govt at least) wants to revise Europe, not break it up. A revised EU has more chance to survive. The blinkered federalist juggernaut that Juncker wants to ride is the surest way to break it up. Ultra-federalist ??? I no way !! Winston Churchill was far more Federalist than Juncker ! In fact yes europe needs a “light” federal “institution” for not saying governement ! But Cameron don’t want to revise but he is speaking only the word “shape” like a tiler ! Unlike Ultra-Nationalists like ECR UKIP and it’s centralized Westminster is even endangering the UK itself from splitting if you didn’t realize it yet ! Nationalism was and is the proud spark of all breakup but wasn’t and never is the federalism ! Again with the lies about Winston Churchill ? Churchill wanted ‘Europeans’ locking together so you wouldn’t start another of your bloody wars, no other reason. The British people do not want to break up your EU we will just leave it & rejoin the free world. Lies about Winston Churchill ???? an European how can you say you know so much about us English and not be able to write or spell English….? All clear Mr Little burro ? You basically just confirmed what Mr Burro said himself. Churchill wanted a ‘united Europe’ with the UK and US as close friends / allies on the outside. He never said he wanted the UK to be a part of this United States of Europe. He just saw the obvious need for such a system to help stabilise Europe considering the fact that a massive global war just occurred on a scale never before seen, and considering the fact that the USSR was now a Superpower occupying half of Europe. I think it’s the other way around Justin: The UK has been ‘dancing’ for years and hasn’t chosen one of its two inevitable paths, none of which include rules made by HM government: either be part of EU as any normal EU country, or becoming the 51st US state. Juncker is being clear, not the UK. Talk about a Paranoid Schizophrenic. He just needs to look at the numbers of British personnel in Brussels, the numbers are falling & set to fall a good deal further. No one is interested in the EU or its currency they can do what the like so long as they don’t think they will be dragging us along. Why does this idiot think we want to break the Euro? I’d be delighted if it collapsed only if it brought down the entire EU but If we were out of the EU before that happened then happy days they can plough on with their Unification of the EU as a single state run from Berlin. To any idiot who knew both Britain and Greece before their EEC membership it was clear neither belonged as partners in ANY organisation. Neither Britain nor Greece should ever have been accepted as honest EEC or EU members — their contacts with each other (and Cyprus) even before joining the EEC has only been treacherous. –With Britain exporting its Feudalism and both their dishonesty –both must leave the EU, the sooner the better. Why doesn’t the UK be clear for once on Europe? Opt-out of the EU, and quicken the way for becoming the USA’s 51st state. The UK will have to make some choices, either assume itself as the 51st US State or become a full fledged member of the UE. Not much of a problem, it just requires more clarity and less nonsense from old Albion. The UK will have to make some choices, either assume itself as the 51st US State or become a full fledged member of the EU. Not much of a problem, it just requires more clarity and less nonsense from old Albion. It is definitely not Jucker living in a parallel world, but apparently many UK citizens: it is so evident from all the comments I read (not only on Euractiv). Jucker says explicitely what most of the Member States think: the UK is not a position to lecture others. They want to break free: fine, it is a loss but not a dramatic one. Let’s see where the obstinate and ideologic neo-liberalism drive them. My bet is to irrelevancy and poverty, but I respect individual choices. We’re irrelevant now, we have no voice in the world because we signed up to have it filtered out by the Lisbon Treaty. We have chose to keep quiet & mind our own business & concentrate on stopping the EU creeping into our lives any further than it already does. If you don’t like that so what, we don’t like being pushed & prodded by your friends than Putin does & look where that has got the EU? The only voice you want to hear from us is one agreeing with your agenda & standing behind Comrade Juncker smiling like an imbecilic fool while he spouts his tripe. Not going to happen, we are either accommodated or the EU remains in a constant malaise. Why don’t you stop talking about an EU military & go away & build it? stop looking to the UK to go along with it but nothing is stopping you going away & building it outside the institutions of the EU just as you got around the UK Veto recently. So I ask again why aren’t you doing it? After the Junta dictatoriship Greece gained back its democracy. However up till 2015 almost all goverments gained their power by promising the people of Greece places of work in the public sector. However this happened easily because the funding foir the public sector came out of loans without credibility from either side, inflating the country’s dept. Then by entering the Eurozone the problem persisted and worsened as the people of Greece thought that our good life was coming out of our own economic prowess. Only a few economists were aware of what was really going on. Our politicians on the other hand kept feeding the people well-payed jobs in the public sector in exchange for their votes. The grave mistake was that the people of Greece spent tons of money on consuming and not on investing. Everyone had money but no one was sending it to the real economy so we could have sustainable growth. The Greek people didn’t know how to invest. Our politicians kept that from us and kept us away from enterpreuneuship. Because they had ascnedned by making deals under the table with a few select familes- dynasties who in turn always promised to fund their elections campaigns. They only wanted one thing in return from the politicians- to kill any investing spirit in the greek masses who didn’t need it anyway at the time because they were being fed with wellpaid jobs in the public sector. So the true economy was and unfortunately still is at the hands of those families who kept it for themselves. THAT IS THE PROBLEM: EVEN IF WE LOWER WAGES AND PENSIONS IT WILL DO NO GOOD BECAUSE THE TRUE ECONOMY IS A SLAVE OF A FEW SELECT FAMILIES AND THEY WON’T LET IT FREE. The new goverment has already started rectifying that. Unfortunately this big move came too late in our finances history. We simply ask from all the other peoples of Europe to understand that enterpeneurship and true investing spirit is back in Greece. However the previous goverments were so corrupt that when the crisis hit they tried to preserve the corrupt system that kept them in their positions (well paid jobs in the public sector and keeping the same masses away from the real economy and investing so the big families can have it for themselves and in return fund the policians’ campaigns). They signed very bad deals for more easy money with the IMF and EU. However no sovereign nation state should be forced into bad deals. Bad deals are a problem in international relationships and always lead to disaster because no one can truly force a nationstate to uphold its end of the bargain, especially in our case that fullfilling our end means total poverty and hunger. However the corrupt politicians were so afraid of losing everythiing that when the time came for real reforms (via memoranda) they didn’t make ANY to liberalize the economy or make it cheaper and instead lowered wages and pensions and raised taxes ONLY FOR THE MASSES because they were the easy targets. Because truly making the reforms and liberalizing the economy would mean that they would lose the support from the big families who as i stated earlier, wanted to be the only enterpreneurs in Greece. This corrupt system became apparent to the Greeks very recently, in late 2014 when Alexis Tsipras revelead it. The greek people are not to blame. We are hard working, honest people. We just never had a liberal economy because of the corrupt system that governed us. When we were asked to make one, the same corrupt system denied the reforms that would bring it to fruition for their own personal gain. Today we have idealists on the goverment. But it’s better than having corrupt officials. At least they try to protect the people and the state. I implore the peoples of the European Union to hear the new goverment’s case. Do not ask the Greek people to suddenly liberalize their economy, we do not have the mentality for it yet and will surely selfdestruct the economy if we do it at this point. Instead let it liberalize itself by making the overall environment safe by keeping the liquidity alive in the country and help us kill the corrupt system that still exists despite the changes taht have already beed made. I cannot put it more simply and fully than that. Good to see Juncker is not minimizing political turmoil of UK or Grexit. I recall when we introduced Euro, under Maastrict Treaty, mandarins of UK treasury were literally laughing at the idea of a single currency (against Sterling/USD). Tony Blair never supported Euro when he took over from Thatcher. So the Limey’s will have their final laugh when UK exits EU (2017!). Decline and fall of Britain – ie. Scotland becoming a nation-state – will more or less tell the tale of Limey prudence in face of Single Market access…. Grexit is going to dangerous because of the scale of default involved, E+240 Billion debt) if it becomes a political reality. Someone said today that EU/Euro will not exist decade or so from now….!!!! If Israel was part of the EU and Juncker had said that the jews would bring down the euro after grexit would that not be an ignorant and biggoted statement? Yet he says anglo-saxon rather than jewish/germanic/gaulic and somehow it is ok? Note also the way he delivers his lies. He cannot directly claim Britain tries to dominate and dictate EU policy, its a ridiculous claim. Instead he says Britain “is not in a position to”, the statement implies without stating. He did the same live on Austrian tv when he said he wouldn’t stand back and see Poles and other eastern europeans discriminated against in the UK. Sounds great until you realise they aren’t, no political party has ever proposed they should be and we have had a large Polish community here long before the EU was thought of. Juncker is a self confessed liar but a clever one. He is now openly racist. Now he is openly working with the opposition party of a nation state rather than their elected government. Whether you are an EU enthusiast or a Europhobe this man is a disaster for the EU, I fear the damage he will do. Who voted for this clown,thats right nobody,so suppose that makes him an anti democratic dictator . Panic: The goy are escaping! If the article is an accurate reflection of the speech it is frighteningly bad. The Eurozone has problems which include poor analysis of the data for Greece’s entry into the Eurozone/poor detection of fraud, poor enforcement mechanisms for various things like inflation targets (Germany) and deficit targets (pretty much everyone else). If he is choosing to make up stories about ‘Anglo-Saxon world’ conspiracies instead of facing these problems the European Union will suffer for it. Beyond the Eurozone issues the European Union itself has issues in part due to a desire to speed the unification process beyond its democratic limits. Each time the folks in Brussels can’t get support for some new unification step they have generated a bunch of exemptions and then pretended that everyone agreed to it. The poster child for this is the EU Constitution project – which after failing miserably in referenda was implemented in a hodgepodge of pieces via the Lisbon treaty. That still doesn’t have full support but Brussels is merrily assuming it does and assuming anyone who doesn’t is just being ignorant or stubborn. At the same time, the Schengen agreement has morphed from an open border for citizens to an open border for the world via the most lax member’s asylum policy. If the President of the Commission is going to play games with conspiracy theories in order to avoid real issues the European project will be in jeopardy. The UK is America’s Fifth Column in the EU. The sooner the UK leaves EU, the better off the EU will be. Of course the US and UK want top weaken the EU with a goal to break it up. The Euro represents the biggest threat to the supremacy of the US dollar. Imagine if you issued cheques equivalent to your paycheck every month and those who received your cheques never cashed them. That’s the US Dollar. Just the fact that the Eurozone states trade in euros now, reduced the financial benefits the US economy accrued by having the dollar used in intra-European trade before the euro came about. One reason the Euro is accepted as a means of payment & that is the deutsche mark because it brought some semblance of stability. Did you ever take a holiday to Yugoslavia or Egypt 25 years ago? They took the Pound, the Dollar & the Mark because they knew it would be worth what it started out at when they got it, when they banked it. If the Germans weren’t holding the purse strings of the Eurozone it would be a hopeless currency like those enjoyed by many former Eurozone currencies. I think you will find the Yuan is going to be the currency that competes with the Dollar, it’s all about how commodities are traded. Juncker doesn’t get it does he, It’s not the Anglo Saxon world but the international markets that will shred the Euro. It’s like blaming the wind because the house you built blew down. The Euro is collapsing under it’s own weight & its structural problems. As predicted the IMF’s multi billion rescue packages haven’t been able to save it & now the blame game starts & guess what its everyone else fault but those in Brussels. Whose is the elephant inside the glass shop? Yes, some heading this article has: Juncker: If Greece leaves, Anglo-Saxons will try to break up eurozone. Interesting to notice how the fault bounces around… Wars are waged by the “Americans” that really have nothing to do with mr. man in the street… There are so many things blamed on the Americans when in reality, they have no notion of what is happening, In other occasions the Germans get the blame, or the Greeks… and now this article points to the Anglo Saxons. And in the end is none of them, but the forces that hide behind their names. The same forces that are also destroying the Americans, Greeks, Germans, Anglo-Saxons and everybody else. Don’t blame the puppets, blame the puppet master. Herr Junker you and your ilk appear to be profiting nicely while you wreak havoc both inside and outside the EU. All the Anglo Saxons need do is to stand back and let you continue. This EU is not in anyway like the one initially set up. It has been directed by the 1 % to go after taxpayers in weaker and less popular countries. Go after,- in the sense of trying economic austerity test, rather like bio-tech testing to watch in comfort as these test subject begin their dissent into misery…..misery achieved. The rest will come from the corporate take-over through trade agreements—-see bilaterals.org …Imagine allowing corporations with their record of speculating in their own shares, to be handed the control and ownership of public pensions, educations, utilities, healthcare, protected land and waterways—through the Trade in Services Agreement. Pity those, who yearn for the days of stability and or growth…Internal corporate growth, is really no growth at all….If citizen/taxpayers are able to catch on to the games afoot, they will simply withdraw……Oh, don’t forget, that the TISA deal, has a 5 year ban on any public disclosure of its content, so people will be to hurt and all their ‘rule of law’ nonsense will be void and the real damage to them and all domestic economies will begin….in earnest…with no defense. This is not economic fiction, this explains the need for secrecy, while all of this was being set up.